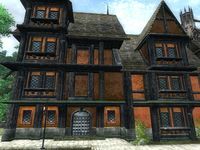 Rosentia Gallenus's House is located in the southern part of Leyawiin. The house is situated in the vicinity of both Ahdarji's house and J'bari's house. It is the residence of Rosentia Gallenus and possibly some unwelcome scamps and consists of two zones, Rosentia Gallenus's House and Rosentia Gallenus's House 2nd Floor. Her dwelling in the western part of the city consists of an upper-class Leyawiin house. On a small, squared table in the entrance, a copy of the book Arcana Restored and another copy of the Black Horse Courier edition, New 'Doomstones' Series! can be found. The small room at the end of the alley serves as a storage room for three barrels that can spawn a few pieces of food plus another barrel that can spawn clutter and a small chest that may hold some pieces of random weapons and armor. Also, a copy of the book Varieties of Daedra can be found on top of a desk. 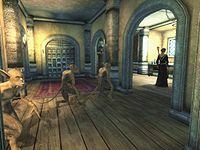 In Rosentia's room, the books Biography of Barenziah volumes one and two, Galerion The Mystic and Darkest Darkness can be found on a shelf near the entrance. Also, on top of a squared table, a steel claymore and mace have been placed. On top of the drawers at the foot of her bed, a red velvet outfit can be found and on top of the other set of drawers, a steel bow can be also found. On the small table next to her bed a copy of Guide to Leyawiin has been placed, and on top of the desk in her room, the books Manual of Arms and Frontier, Conquest can be found. The key to the house is carried by Rosentia. This page was last modified on 27 August 2018, at 16:27.